After making my delicious Chipotle Crispy Skinned Pernil I had a lot of leftovers. It is so good just reheated but I wanted to try it a different way. Whenever I think of pork I think about this yummy pulled pork sandwich I have at a place in the city called Dinosaur BBQ. 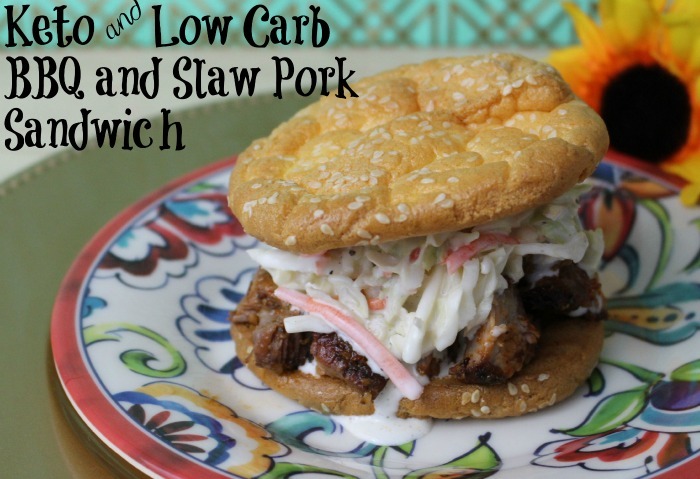 I decided to take my pork and create my take on the sandwich while making it low carb. Separate the eggs and beat the egg whites with cream of tartar until they form stiff peaks. Set aside. Beat the egg yolks and cream cheese until smooth. Carefully fold into the egg whites. Grease a muffin top pan (aka whoppie pan) and divide the mix into the 6 cups. Sprinkle with sesame seeds and bake for 30 minutes in the middle rack. Let cool on the baking sheets and then transfer to a ziplock bag. These keep really well in the refrigerator. Mix the mayo, vinegar, avocado oil, sweetener, salt and pepper. Add the coleslaw and mix until evenly coated. Cover with some plastic wrap and place in refrigerator for at least one hour. It will taste better a day later. Heat up the pork until it has browned a little bit. Add the barbeque sauce and stir around until the sauce is heated through. 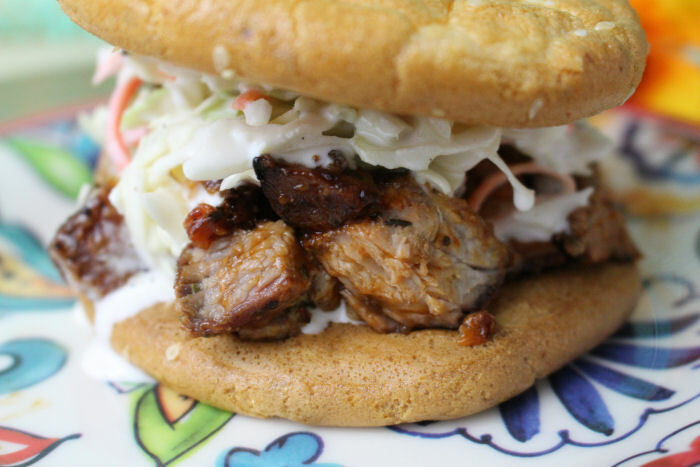 Place a bun on your plate and top it with the bbq pork. 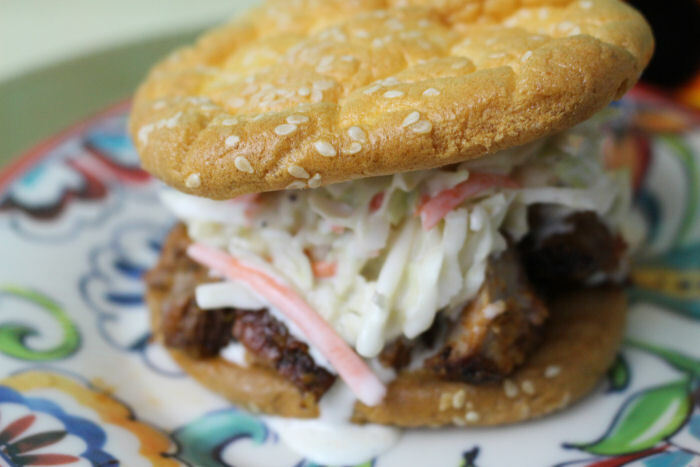 Top the pork with some of the coleslaw. 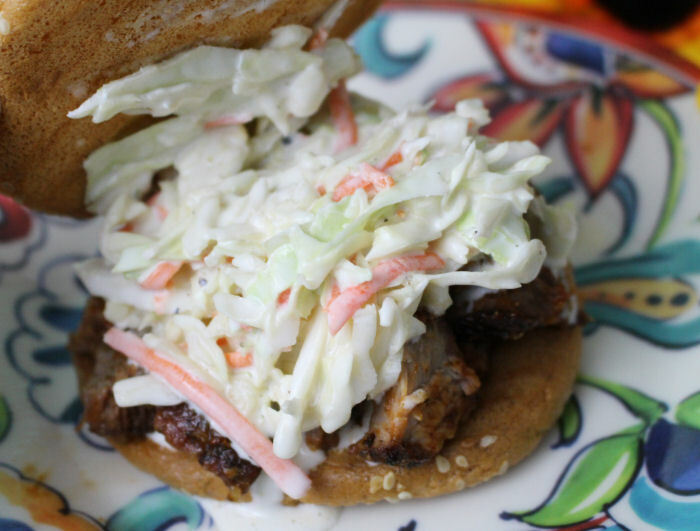 You should have some coleslaw leftover to enjoy later. Top with another bun.